Investigators for the WIAA found the Bellevue High School football program, an 11-time state champion, violated numerous rules regarding player recruiting, benefits and academic support. 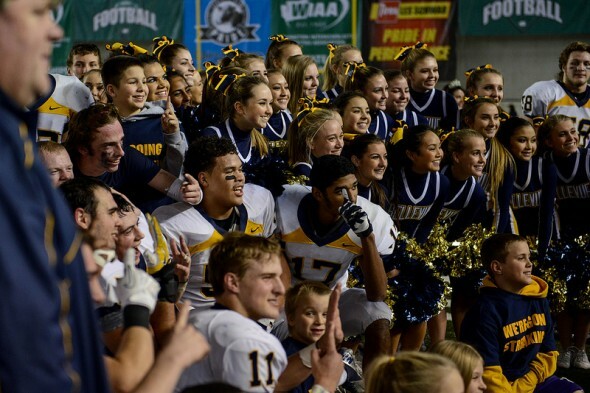 An independent investigation ordered by the Washington Interscholastic Activities Association into allegations of improper conduct by the Bellevue High School football program found multiple, long-term rules violations by the coaches, school district and booster club. The 68-page report released Tuesday claimed all parties broke WIAA regulations regarding player eligibility, illicit benefits and payments to coaches. The report was the culmination of a year-long investigation by Carl Blackstone and Robert Westinghouse, who said they had been hired by WIAA Executive Director Mike Colbrese to look “under rocks, under rocks, under rocks” to ensure that the Bellevue had not gained a competitive advantage through unfair acts. Blackstone and Westinghouse, the latter a former federal prosecutor, found that the opposite was true. The report said that the district had willfully obstructed their investigation and criticized the booster club’s claims that the investigation was racist and abusive in its treatment of players and their families. With 11 3A state titles in his 16 years as head coach, Butch Goncharoff is a legend in Bellevue. While part of the success is undeniably due to a superior playbook, the report makes clear Goncharoff was operating under a different rulebook for years. Whispers have always followed the Wolverines, as they do with many successful high school sports teams. A 2006 investigation by Karin Cathy, initiated by the district, failed to reveal compelling evidence that Goncharoff attempted to recruit Kentwood star running back (and current Miami Dolphins practice squad member) Demitrius Bronson, but discovered that the Bellevue Wolverines Football Club, the team’s booster organization, was paying Goncharoff $55,000 on top of his $5,600 school district stipend. As a result, the WIAA drafted a rule stating that coaches could no longer be paid an amount greater than $500 by a booster organization without consulting with the school district. Following that ruling, rumors followed the program, but none were substantiated. The investigators attributed that to a lack of independence, citing the WIAA’s reliance on self-reporting of violations and the Bellevue School District’s willingness to overlook the program’s failure to comply with WIAA rules. A series of Seattle Times articles examining the football program’s ties to The Academic Institute, an alternative school in Bellevue that the Times said former instructors had labeled a “diploma mill,” sparked the district’s request for an independent investigation. When the district realized that the investigators planned to delve deeply into the Bellevue program, John Harrison, the district’s executive director of schools, emailed the investigators, expressing misgivings that the investigation was exceeding the scope of what was asked by the WIAA. Apparently, Harrison didn’t know just how much the WIAA invited the curtain to be pulled back. The scope asked investigators to look at whether Bellevue players used false addresses to gain eligibility and received subsidized housing. Additionally, it requested that the connection between the football program and the Academic Institute be investigated. Blackstone and Westinghouse found that they were stonewalled by the district. Citing the Family Educational Rights and Privacy Act (FERPA), the district refused to divulge addresses, though there is a provision in that act that grants exceptions for external independent investigators. The report alleges that evidence of players’ addresses was destroyed, against district policy, which states residency records must be kept for three years after a student graduates or withdraws from a school. The school instead told investigators its policy was to destroy the records as soon as a student graduated or withdrew. Blackstone and Westinghouse compiled a list of 42 players who transferred to the program. The investigation turned up five cases in which players used fake addresses to gain eligibility, as well as another seven that the investigators felt could be interpreted as violations. In one instance, a player applied to the school by claiming he was going to live with an uncle while the uncle attended Bellevue College. The player was admitted, but the uncle never enrolled at Bellevue College, despite providing a statement of intent as part of his nephew’s provisional enrollment. When the investigators asked the landlord at the address about the uncle, they learned the student lived there on his own. The coaching staff claimed that it had no obligation to determine whether players were living at their given addresses, shifting blame to the district. The district, in turn, pushed the blame back. The report criticized both for what it termed “deliberate ignorance,” as players had brutal commutes to school in order to play for the Wolverines. While the address issues are serious (a 2006 investigation discovered that 30 Bellevue football players lived outside the school’s eligible zone), the direct interference by the school district with the investigation is more troublesome. The investigators were made aware of a letter circulated to football players and their families shortly after the initial disagreement regarding the investigation’s scope, strongly discouraging them from cooperating with Blackstone and Westinghouse. Several times in the report, it is mentioned that some interviews were conducted anonymously due to fear of reprisals from the community. The Academic Institute is a small, private school in a strip mall that boasts of “customized schedules with the right mix of classes for special needs students.” One feature of the program, says the Institute’s website, is homework designed to be completed before the student goes home. The Institute was first accredited in 1986 by the Northwest Association of Schools, Colleges and Universities. The report uncovered that 17 football players attended the Institute during Goncharoff’s tenure, 15 of whom were a part of the Wolverines football program (the other two played for Bellevue Christian, a private school). The investigators found that the district gave the Academic Institute unparalleled access to district curriculum guidelines, and that it ignored reports from a former teacher that the quality of the Institute’s programs was insufficient. One player who attended the Institute received failing grades in all four of his courses while at Bellevue. At the allegedly comparable courses at the Institute, the player received three B’s and an A. The NCAA put the Institute on an extended evaluation in 2013, calling into question its worth as a place of learning. But the school district took no steps to investigate, with one administrator going so far as to say that she had absolute confidence in the program. The issue with the Institute, investigators say, is that Bellevue coaching staff and boosters enjoyed a close relationship with it. The investigation claimed that Goncharoff had directed several players who were in danger of academic ineligibility to attend the Institute, and in several cases the Institute’s tuition — $15,750 a year — was reduced or even covered by donors to the school for players who could not afford the program. Goncharoff has denied the allegations. In several cases, players’ grades were made available to coaches, who visited the Institute’s offices to keep tabs on players, Goncharoff among them. The investigation says players at risk of failing their courses were directed to the Institute, and received financial help with their tuition while they received a substandard education. The final target of the investigation was the Bellevue Wolverines Football Club, the booster organization that paid Goncharoff $55,000 in 2006. According to the report, the club has paid Bellevue football coaching staff $588,568 between 2002 and 2012. The club released a statement Tuesday that claimed it had paid Goncharoff $60,000 a year, but not to coach the football team. Instead, it claimed, the payments were for the coach’s work at summer camps, youth football camps, and non-football events. Even if that is the case, and it is true that the booster club did not violate WIAA regulations in payments 120 times beyond the $500 limit, there is a compelling argument that the boosters failed to follow the spirit of the rule that was designed to help assure fair play and a more level playing field. If the boosters believed that they were doing nothing wrong, then full disclosure to the district of the details of its payment to Goncharoff and staff should have been harmless. It did not happen. The report also focused on a series of payments from Goncharoff and an assistant coach to a player’s father, who had been the impetus for a self-reported violation by Bellevue High School and self-imposed two game suspension for providing rent and food money to the family. Initially, the school divulged that Goncharoff had given a player’s father $300, but the report claimed that a questioning of the father revealed the amount to be closer to $1,200. Meanwhile, a $3,000 loan from an assistant coach so the family could remain in its home was determined by the investigationto be a gift, making it remuneration for a football player. The investigators called for new WIAA rules demanding full compliance with external investigations, and recommends further investigation into incidents and alleged violations were compromised by the district’s obstruction. If the report’s findings are validated, penalties could include probation to forfeiture of state championships. I’m certain Tom Brady’s influence will come into play and we’ll see this go to court. However other schools should be put on alert that the state is watching. You knew stuff like this had to be happening when Bobby Knight was reported watching Damon Bailey play in the 8th grade. And that was in the 80’s. Recruiting is nothing new in high school sports, nor is rule-bending, unfortunately. The scope of the violations found by the report is unprecedented in Washington, however. The report will likely cause major overhaul in WIAA regulations. “my room mate Mary Is getting paid on the internet 98$/hr”..,……..!wc272ctwo days ago grey MacLaren P1 I bought after earning 18,512 DoIIars..it was my previous month’s payout..just a little over.17k DoIIars Last month..3-5 hours job a day…with weekly payouts..it’s realy the simplest. job I have ever Do.. I Joined This 7 months. ago. and now making over. hourly 87 DoIIars…Learn. More right Here !wc272:➽:➽:➽➽➽➽ http://GlobalSuperJobsReportsEmploymentsSuperGetPayHourly$98…. .❖❖:❦❦:❖❖:❦❦:❖❖:❦❦:❖❖:❦❦:❖❖:❦❦:❖❖:❦❦:❖❖:❦❦:❖❖:❦❦:❖❖:❦❦:❖❖:❦❦:❖❖:❦❦::::::!wc272………. you have to reach back for a dig on bobby knight when north carolina’s bball program has currently passed players along in its bogus afro american studies program? I’m not sure anybody is watching. For years, the WIAA (not a state agency) has been underfunded and ineffectual, mostly because most school districts, ADs and coaches don’t want vigorous oversight. Not in their self-interest when so many parents want to win at any cost. but we didn’t know how complicit the school district admin was. that’s a bit of an eye-opener. how about replacement of all of the bellevue school district administration that allowed football coaches and boosters to ride roughshod over them and abdicate the district’s moral obligation to act in the best interests of all of its students, not just ones who run a 4.4 forty and tackle well? the coverup by the district and bhs of the rules violations and techincal workarounds to justify the use of out-of-district athletes and then the pursuit of opacity and refusal to cooperate with the investigators that the bellevue school district asked to investigate doubles down on the massive unethical message to all bellevue district students that cheating is ok and should be rationalized in any way possible. as a parent of hs students i am disgusted. thanks for the great article, andrew. you should write more about this. there’s so much more to learn. We believe that Ms. Flood’s investigation uncovered information relating to the payment of coaches, the payment of tuition at the Academic Institute, and the payment of money to parents of a BHS football player. None of this information, however,was contained in Ms. Flood’s final report to the District. . . Superintendent Mills and Annie Cole have denied our request to produce all reports and draft reports prepared by Ms. Flood. Indeed, we have repeatedly been assured by Messrs. Harrison and Lowell that Ms. Flood only prepared one report. Dr. Mills and Ms. Cole have also denied us access to all of Ms. Flood’s notes and memoranda prepared during the course of her investigation. Most significantly, they have precluded us from even interviewing Ms. Flood. this is what the bellevue school district thinks is acceptable behavior? I saw the tape of Superintendent Mills’s press conference. He was evasive and duplicitous in his phony concern for the privacy of the students, A total slimeball, I’d say. Not as much of a backslapper as Mark Emmert, but cut from the same cloth. No doubt in my mind that he has been in on the scam from the outset.